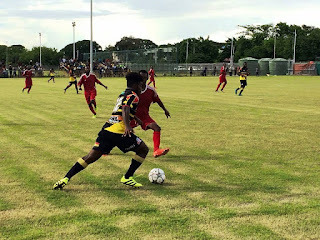 A determined FC Momase muscled their way through a scoreless first half until it was just minutes to the full time whistle when they opened up their scoreboard with their first goal trailing to a more relaxed Madang FC 2-1. Momase never ran out of steam until the dying minute when they nailed their second to deny a Madang win and seal a draw 2-2 at full time. Madang’s first goal was netted in the first half and again in the second half even before Momase registered a point and looked lethal from the start with its well coordinated ball work.